I BADLY NEED YOUR SUPPORT! On this day exactly a year ago, I received the Best Text Blog Award from the organizers of the 7th Annual Population and Development (PopDev) Media Awards. Although I won four other competitions after that, going up that stage that night to receive my trophy remains one of the highest points of my life. As noted in a previous post, the PopDev Media Awards won’t be held this year, but despite that, I am once again running to get another blogging award. And this time, I will need your support to achieve it. 2. 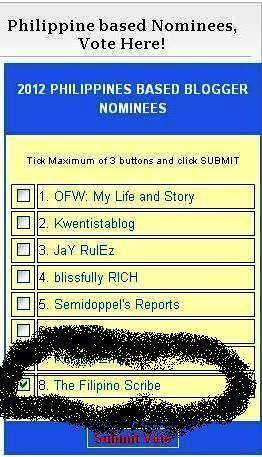 In the page’s right side, you will find the list of ten nominees under the “Philippine-based bloggers” table. 3. Please check the space before nominee #8 which is The Filipino Scribe. Click ‘submit vote’ after. Voting takes less than a minute and there’s no need to register. My official entry to the competition is titled “Embracing Social Media in my Life.” I have been writing about OFW-related issues long before taking part in this competition. Last year, I wrote about the “Saudization” labor policy’s potential impact not just for Filipinos already working in that country but also for other workers that are seeking jobs there. A few months ago, I wrote about Manila Rep. Trisha Bonoan-David’s decision to kill her proposed measure that would have raised the contributions of OFWs to the government emergency fund from $25 to $50. OFW rights advocate Susan Ople went on to credit this blog for posting Bonoan-David’s actual letter to the House Majority Leader regarding her decision. Early this month, I came up with a post tackling the potential impact of Filipino-Americans in the 2012 United States presidential race between Barack Obama and Mitt Romney. According to figures from WordPress, this blog has received at least 1,000 views from readers in fifteen countries other than the Philippines. Their consistent support for my blog inspires me to continue writing more about issues they care about. Whatever happens to my participation in this year’s PEBA, I will certainly continue doing that. 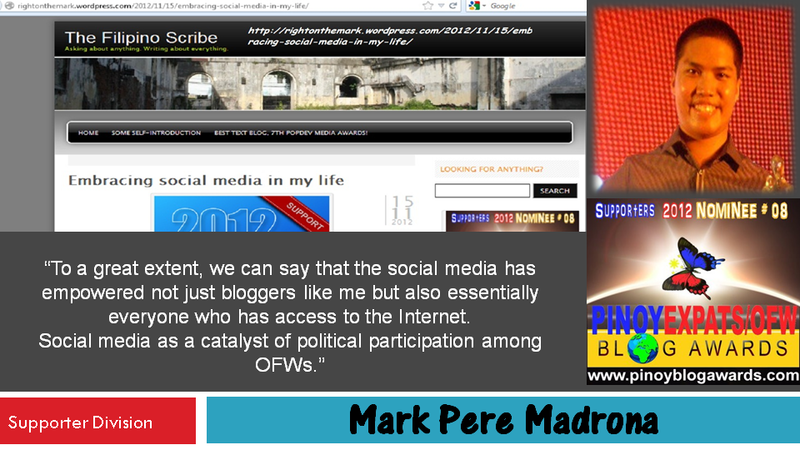 Visit http://www.pinoyblogawards.com, see the right side, check the space before nominee #8 in The Filipino Scribe. Click “submit vote” and you’re done! Voting ends on December 5. As of posting time, I remain in second place in a field of ten nominees. With the help of our blog followers and readers, victory is achievable. You can vote more than once as long as you’re using a another device.